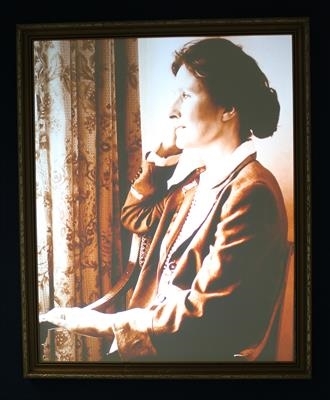 A contemporary, ‘living’ portrait of Lady Nancy Astor created as part of my masters in Contemporary Art Practice. Lady Astor was one of Plymouth’s most famous residents and the work re-animates a framed photograph on display at 3, Elliot Terrace. The contemporary sitter bears a close resemblance to Lady Astor and the video portrait initially presents as a traditional still image, but on closer examination reveals a living representation, constructing an ethereal portal into the past.